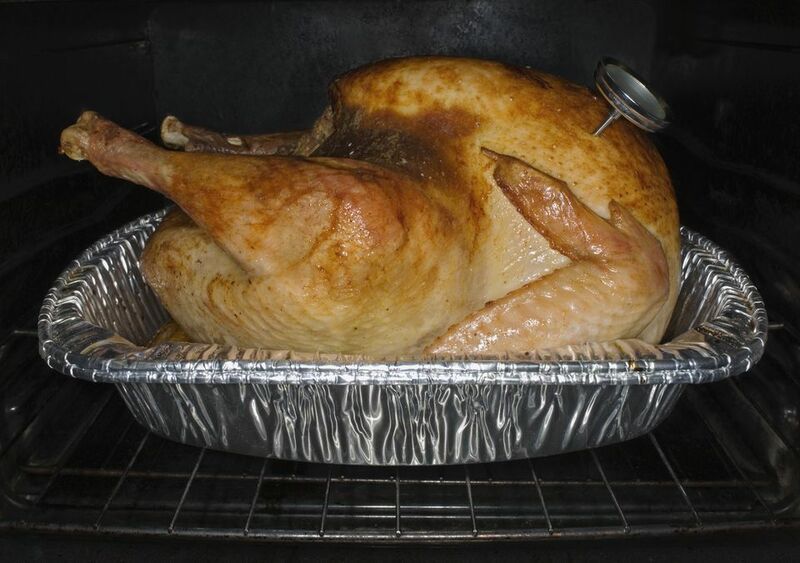 If you do not have a suitable roaster, a disposable aluminum foil roasting pan can be used for cooking a turkey. However, you will need to use a certain amount of care with a foil roasting pan. These tips and tricks will help ensure that your Thanksgiving turkey is cooked correctly. Only use foil baking pans that are designed for roasting. They are larger, thicker and have higher sides to accommodate a turkey and the greasy juices that are generated during cooking. When faced with price and foil thickness differences, always chose the heavier and better quality pan. It's worth the extra money to ensure that your turkey doesn't end up on the floor. Before buying or using a foil roaster, hold it up to the light and inspect it for and any signs of cuts or holes in the foil from previous use. If the holes are very small you could choose to line the pan with aluminum foil. But, when in doubt, discard the pan. You should only use bakeware that is deemed to be safe. Always place a metal cookie or baking sheet underneath the foil roaster. Foil bakeware is often too flimsy when it contains a heavy turkey; it could buckle and spill its contents when you try to remove it from the oven. A sturdy baking sheet will make the foil roaster more stable and will enable you to remove the roasting pan (and metal sheet) safely from the oven. If there are any cuts or breaks in the foil that went unnoticed, the pan could leak. A metal sheet underneath will catch drips and reduce the risk of grease spills in your oven. When testing your turkey to see if it is done, use care with a knife or any sharp utensil to ensure you do not puncture the foil roaster. Poultry racks or lifters should not be used in foil, as they could puncture the foil material. Although foil bakeware can often be re-used, in this case, it's not generally recommended. Once you've used one for heavy meats or poultry, any bend in the foil could jeopardize the integrity of the foil pan making it hazardous in the future. After the turkey is removed from the foil pan, you can transfer the poultry juices to a pot in order to make gravy. Foil pans should not be used for stovetop cooking. It's highly recommended that you use a durable roasting pan for cooking a turkey as opposed to aluminum foil pans which have no handles and require more care with handling. Over time, a purchased roaster will save you money otherwise spent in disposable foil bakeware. Roasting pans are very practical, economical and essential cookware for a variety of cooking needs. A Roaster Oven Is Perfect for Your Turkey or Large Batches? Are You Guilty of Mistreating Your Nonstick Pans?